Many times in our lives, we tend to hold on to things, like old grudges or to people who no longer exist or that are no longer relevant in our lives. Some of us allow our past hurts, pains and even our past relationships or marriages keep us from advancing or from seeking, new love in the future. Many men or women have been known to hold onto their past so tight that when someone good enters into their lives, they do whatever it takes to run them away. I have heard many of my family members or friends complain, then talk about what this person may have done to them and while have others complain about how bad, their exes may have hurt them in their past. What they don't realize is that in life, everyone will face their share of heartaches or pain and many people will go through their share of storms, trials or tribulations. But we all have to live through them and move on. Many of us will loose some people we love, due to death or illness and while other people will have an ex- boyfriend, ex-girlfriend or even a ex-spouse that will either remarry or they may just simply move on with their lives without them . If this has happen to you, then only thing I would say to you is, So what if your ex - man or woman has found a new lover and why do you even care? If one doesn't find or acquire the ability to move past yesterday, then there is no way that they can advance into tomorrow or the future and then do anything productive today. They instead will be stuck in a time warp, while the rest of the world and even their own children will go on living their lives without them. As my late grandmother would put it," Life will go on with you or without you, so just simply Let Go!" I know you aren't the same person you used to be, as fit as you were or as good looking or pretty as you once were! Why? Because in time with the grace of God, all of us get a little grayer, older, wiser and loose some of our youthful ways. I know there are a lot of men or women in the world today, who's minds haven't yet caught up with their age or their bodies. I think that is why you see even today, some older men or women in their forties or fifties dressing like teenagers or still holding on to some old clothing, worn out hair styles or fashions that are obviously out of style. This reminds me of what my late grandmother would say, when she would notice someone older trying to be something that they are not or when someone or somebody, that would refuse to let go of an old flame or old love. She would say, Stop! You're to old for that and by now you should be over it! That's right you aren't what you used to be! Its over! He or she doesn't love you anymore, get over it! Yes, I know he or she maybe a dog or whore and they may have used you. But it comes a time when you should stop talking about it, stop being a cry baby and move on. Get yourself together start a new life,then find yourself a new lover, man or woman! 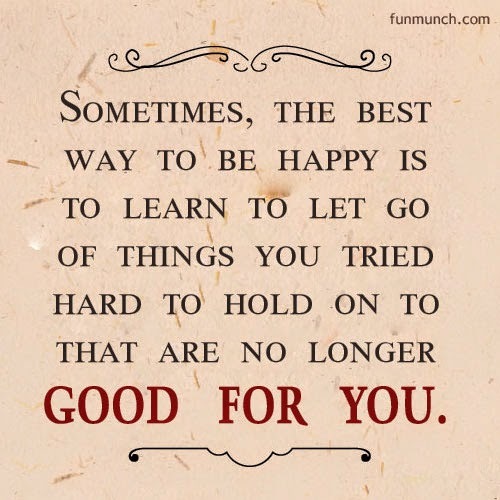 I know baby it may sounds harsh, but sometime you just have to face the hard facts, its time to Let Go! Write in and express your thoughts or opinions on the subject. Charles, thisis a good message. I have a co worker who can't get passed believing a man can treat her well because her ex husband put her through so much. I just got tired of "preaching" to her that you can't punish all men for what one man did to you. I told her you will miss out on a good thing because of her insecurities. For me, I have let go of all the things my ex husband put me through and to this day I can be in his presence without feeling any anger towards him, he cuts my grass every two weeks, fix things for me and he knows we could never be together again. But people can't accept that we get along so they asuumed we are going together. I can't worry about what people think, life is too short. The Lord knows my heart and the life I live. So many of us would be so happy if we could get true deliverance from past hurts and live a fulfilled life.